Which Thuja Should I Choose – Green Giant or Emerald Green? When it comes to planting hedges, the most important thing is to make the right choice of plant variety. After all, you are going to live with this hedge for many years, and you are going to invest some money into it – so you want to make the right choice. The evergreens called arborvitae, cedar, or thuja by gardeners are the most widely planted, by a long way. In some areas, you might choose instead Leyland Cypress, Italian Cypress, or even the tough Spartan Juniper, but for most people, in most areas, cedar tops the list. What zone do I garden in? How fast do I want a hedge? This is the easiest thing to consider, as it might lead to an immediate decision. If you garden in zones 2, 3, or 4, then Emerald Green is your choice. It is the only plant hardy enough to survive your winters, and it will do that easily. Similarly, if you live in zones 8 or 9, then Green Giant is for you, as long as you are able to provide water, especially during the early years. If water is an issue, you might want to look elsewhere, perhaps to Italian Cypress, or a Juniper. If you live in between those extremes, in zones 5, 6, and 7, then you still have choices, because both arborvitae will grow well in those areas, and you should move on to some other considerations. Both Green Giant and Emerald Green are tolerant of a wide range of soils, from sand to clay, and from acid to alkaline. Although it is good to know your soil type, as it is a great help when you choose many other plants, here that basic information is not going to make much difference. When it comes to water however, there is a difference. Both do well in damp soil, but Emerald Green has a definite preference for moisture, so if you have poorly-drained soil, or you get a lot of rain and snow, so your soil is often wet, then that is a slightly better choice. On the other hand, if your soil tends to dry, and you are prone to dry summers, then the tough Green Giant is your friend – standing up to drier conditions better. With this issue, the answer is clear. One of the big failings of Emerald Green is that deer love it, and if that is a problem for you, then choose Green Giant right away. Although deer are always a little unpredictable, and if hungry enough they will eat just about anything, the experience of many gardeners is that under normal conditions they will avoid Green Giant. If you live in a place where the first snow brings deer to your neighborhood, that is the arborvitae for you – a clear winner in this category. Here too, although both plants are fast-growing trees, everyone agrees that Green Giant is one of the fastest growers around. It will easily add 3 feet a year under reasonable conditions, which is perhaps a foot more than Emerald Green will do. Most people want speed, and a hedge in a hurry, which is why Green Giant is such a popular plant – nothing but grass grows faster! Shade is a fact of life in many gardens, and the last thing we want to do is cut down those majestic shade trees we have around us. On the other hand, especially on a new property, the site can be very open, and the sun shines down relentlessly all day long. This can lead to two problems. One is the obvious summer issue of dryness, and here Green Giant, with its higher drought tolerance, is also the best choice for full sun. If you have a lot of shade, then Emerald Green is just a little more tolerant of that, so other things being equal, it could be a better choice for shade. The second issue is a winter one. When the weather is cold, it can be hard for plants to draw up enough water. So, when warmed by the sun, the foliage losses water, and if it can’t be replaced, discoloration called ‘bronzing’, and even foliage death, is possible. If you water well in late fall, death is unlikely, but bronzing happens more easily. Emerald Green is more prone to this, so again, if the area you want your hedge is very sunny, then Green Giant is the way to go. You can see that there are no hard and fast rules here, and there are several things to consider when making this important choice. Perhaps one more general thing to consider is this. Thuja Green Giant is a hybrid plant, a cross between western redcedar and Japanese arborvitae, and hybrid plants are almost always tougher, more vigorous, faster growing and overall the better choice. So if at the end of this exercise you have no clear winner, the best advice is to choose the jolly Green Giant. As many gardeners have come to realize, this outstanding plant is the top choice, unless other factors are strong enough to swing the scales to something different. It is hard to go wrong with this plant – it’s the safest option for almost everyone. Planting a hedge or screen for your garden is a big step – you will be looking at it for a long time, and it will be a backdrop to everything else you do in the garden. Getting it right is important, and that means making the right choice of plant. There are lots of plants suitable for building hedges and screens, but some stand out as top choices. Many gardeners these days are choosing Thuja Green Giant, and there are lots of good reasons they make that choice. Here are seven, and considering them will help you decide if this plant is the right choice for you too. Building good hedges and screens is usually a priority in a new garden. Sheltering your property from wind, roads, or neighbors is top of the list for almost everyone – and makes it possible to truly enjoy your garden. So fast growth is really important to give you that tall, dense hedge as soon as possible. This is where Thuja Green Giant literally stands head and shoulders above the competition. With growth rates of three feet a year easy to achieve with some basic watering and fertilizing, in just a few short years you will be looking at a substantial hedge that gives you the screening you want. No decade-long wait for privacy, no hedges growing a paltry few inches a year. This plant really delivers on the fastest growth possible. You can plant Thuja Green Giant everywhere from zone 5 to zone 9. This covers almost all the continental USA, with the exception of the most northerly parts of the north-east and mid-west. In those areas, the best choice is Thuja Emerald Green, a super-hardy relative of the Green Giant, which will grow well in all the coldest parts of the country. Whatever your soil – sand, loam, silt or clay, Thuja Green Giant will grow well. With the hybrid-vigor coming from its two different parent species, it is tougher and more vigorous than any other Thuja, and soil is not a problem. If you have very sandy soil, or heavy clay, then adding plenty of organic material to the soil when you prepare the planting area will really give your trees the best opportunity to grow well for you. In sandy soil the organic material holds water and nutrients, in clay soil it improves the drainage and air penetration into the soil. These are very beneficial improvements, and energy put into soil preparation is always rewarded by optimal growth. Even wet soil is not a problem, if it is not constantly wet. Soils that stay damp are tolerated well, and it just means you don’t have to do much watering! Some other hedging plants develop diseases of the root system when the soil is often wet, but this is never a problem with this plant. Only if your soil is permanently wet, such as along a stream or beside a lake, will you need to choose a truly water-loving plant, such as the Bald Cypress, Taxodium distichum, a deciduous conifer that grows well with its feet right in water. In many gardens ‘full sun’ is an ideal, not a reality. Once you have some trees growing, areas of shade are inevitable, and your hedge must grow evenly in a wide range of light conditions. Thuja Green Giant does just that. It will grow well in full sun, in areas that are shady for 50% of the day, or with dappled shade, with some sunlight coming through. Only if the shade gets very deep will the growth slow and thin significantly. This means that with a long hedge passing through different light conditions, the growth will be even, and you will be able to easily maintain a level top and a solid hedge. Remember too, that shade from buildings is not the same as overhead shade from trees, so on the north side of a tall building, even if there is very little direct sunlight, growth will still be good, because the light is not filtered by passing through the leaves of taller plants. Thuja Green Giant is truly evergreen – it doesn’t turn brown or bronzy in winter, as so many other hedging plants do. All year round you will have a beautiful green wall behind your garden, fresh and attractive in the coldest weather. Some evergreens always bronze in winter – the foliage turns brown and dull in freezing weather. Thuja Green Giant stays a healthy green right through the depths of winter, so it always looks great. Note: if plants are not adequately watered, especially if they are newly planted, and at the limits of their hardiness, then drying out of the foliage may occur, turning the branches brown. This is not winter bronzing, but actual death of the branches. Always soak plants in late fall, and in very exposed locations use an anti-desiccant spray for the first few winters after planting. The soft foliage of Thuja Green Giant is easy and pleasant to trim. No sharp needles to deal with, and if you trim regularly the foliage can just be blown under the hedge as a natural mulch. This tree responds well to trimming, growing denser and denser, making an impenetrable barrier. 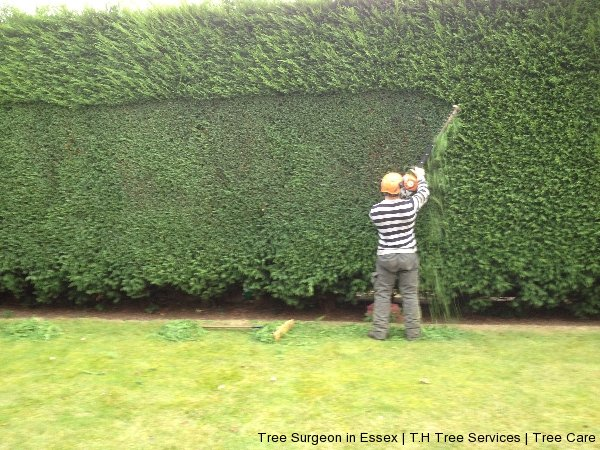 Just remember the basic rules of hedge trimming – start when young, don’t wait till it reaches full height, and trim the top more than the bottom, to keep the lower parts thick and green. After investing both time and money into developing a good hedge, the last thing you want is to have it start dying of pest attacks or diseases. This can happen with some popular plants that are choosy about the climates they like, and can easily be planted in the ‘wrong’ locations. Thuja Green Giant is resistant to major pests and diseases, and if you give it some basic care, it will respond by growing well and never giving you any serious problems at all. You can expect to have a healthy, vigorous hedge or screen for decades to come. When it comes to fast-growing evergreens, we all know that Thuja Green Giant is right at the top of the list. But even the best of us can use a little help, and your plants are no exception to that. If you are planting Green Giant for a clipped hedge, a taller screen, or as a beautiful specimen tree, here are some tips on where to put your energies most effectively, to give you the fastest, strongest and healthiest growth from this plant. Strong roots mean strong growth, and for your trees to make the strongest root system, they need good soil to grow into. Thuja Green Giant is a tough plant, but if you prepare the area well, and break up the soil deeply, across a wide area, then the result will amaze you. You can easily prepare the area for one plant by digging with a spade, but for all but the shortest hedge, a powerful rototiller is the way to go. Rent the biggest one you can handle, and make sure you go down deep. It is easy to skim across the surface and it will look great, but your trees need broken-up soil underneath them. If you can break up the soil 12 inches down, that is ideal. Prepare an area at least 3 feet wide when planting a hedge. No matter what kind of soil you have, adding organic material always improves it. Sandy soils will dry out more slowly, and have more nutrients, while clay soils will drain better and allow more vital oxygen down to the roots. Use something rich – like well-rotted sheep, cow or horse manure – if you can get it, otherwise garden compost, rotted leaves, or peat moss will be great too. A layer 3 inches deep all across the area you are preparing is about the right amount. More plants die or suffer badly from lack of water when newly-planted than for any other reason. Start out by watering the plants in their pots the night before you are planting. If the area you are planting into is dry, then water it well a day or two before you plant. When planting, put back about two-thirds of the soil and firm it down around the roots – use your feet for this job. Then fill the hole to the top with water, and let it drain away before you replace the rest. Unless the soil is dry, you don’t really need to water again – the watering you did down into the hole will make sure those root-balls have plenty to get them started. Immediately after planting the roots haven’t spread into the surrounding soil, and they rely on the soil in the root ball. For the first few weeks, water by letting a hose-pipe trickle water slowly down close to the stem, or use a gentle spray nozzle to soak the area right around the plant. Trees can die of drought surrounded by damp soil, especially if they are planted too loosely, meaning the root-ball is not firmly connected to the surrounding soil. Water every day in hot weather for the first two weeks, or every second day in cooler weather, or if you have heavy soil. Then taper down to a once-a-week soaking during that vital first year of growth. After that you will only need to water when the top few inches appears dry. Use a fertilizer blended for evergreen hedges. It will have a big ‘first number’ in the fertilizer formula. Always follow the directions, as too much, or too often, can be even worse than nothing. At first a water-soluble fertilizer that you mix in a can, or apply with a hose-end dilutor is best, because the nutrients are quickly available to plants with a limited root system. These must be applied regularly, at low doses, so to reduce the work involved, switch to a granular fertilizer after the first season. Although they are more expensive, if you have a busy life you will probably find slow-release fertilizers a worthwhile investment. They only need one application a year, and release their food steadily over the whole growing-season. Don’t wait for your plants to reach the final height you are planning – this is the commonest mistake in growing a hedge. For a solid, dense hedge, you need a well-branched internal structure, and the way to develop that is by trimming early. You only need to take the tips off the new shoots, just an inch or two. Do this regularly, and your plants will respond by branching much more, and developing a strurdy structure. You can also begin to create the right profile, which is the last tip we have for the best hedge you can grow. Older hedges that are thin and dying at the base at common, but that is exactly the area most seen, and most important for privacy too. The mistake is always the same, letting the top grow too wide, and even deliberately trimming the bottom into a rounded shape, undercutting the upper part. The right way to do it is to keep the bottom wider than the top, starting at ground level. The sides should slope in a little, not go straight up, or worse, widen out. It is easy to make this mistake, because the top will always grow the fastest, so if you trim off an even amount, the upper part will naturally end up wider. Take more from the top than the bottom, and let light penetrate right down, so that the lower branches remain healthy and green, giving you screening right to the ground. With these few simple tips, you can be sure that your Thuja Green Giant hedge or specimens look great, and grow as fast as they can, giving you the perfect finished effect. What’s the Best Shape for a Thuja Hedge? Thuja Green Giant is the most popular hedging plant there is, for all but the coldest areas. 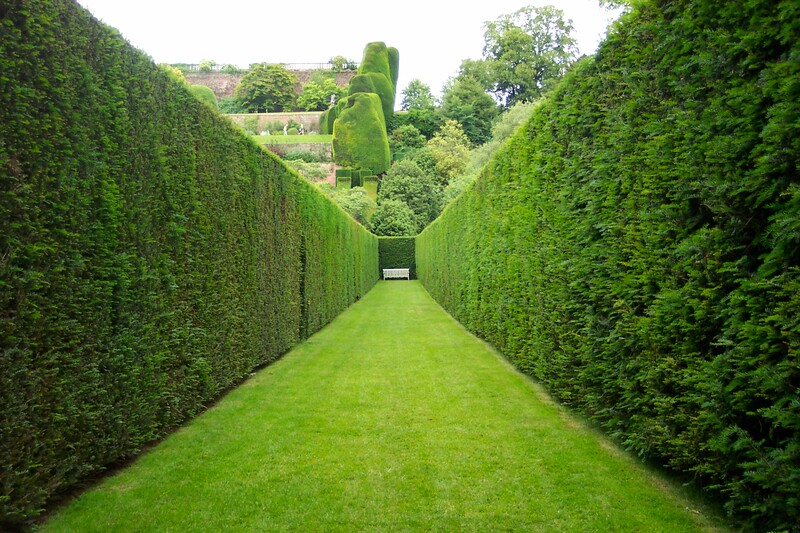 Many people are planting it, and then asking themselves exactly this question – what is the best shape for me to train me hedge into? The answer is not difficult, although there are some things to think about, and how to achieve the best result it is also something to consider. Your hedge will tend to grow faster and more vigorously in the top few feet, than it does lower down. All the water and nutrients are sucked up there, and the bigger that part grows, the more it will take everything away from the lower parts. That way, in nature, it will make a tall tree with a trunk – keeping its branches safe from grazing animals. But we don’t want that, we want green all the way to the ground. We need to control that vigorous upper growth more than the weaker lower growth, to keep a good balance. When you trim, if you find yourself taking several inches more from the upper sides and top, than you do lower down, then you are doing it right. Another practical reason for keeping a narrow top is that it greatly reduces the risk of your hedge splitting open under a heavy snow fall, or even in fierce winds. A big, fat hedge is much more likely to break apart than one that is slim and upright. It is clipping that keeps it dense, not thickness. The more you clip, the denser your hedge will be, even if it is only a foot wide. 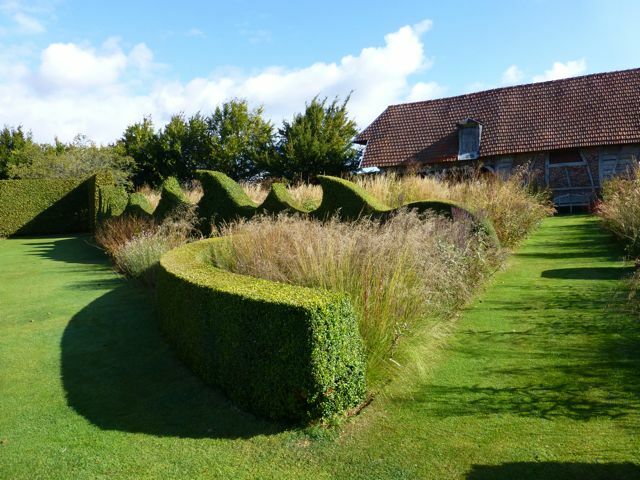 This is a perennial discussion topic among hedge growers – should the top be rounded, like half a circle, or trimmed square, with a flat top, and crisp corners? Many people find the square look more attractive, especially if you have a formal-looking garden. If you can keep the top thin – just 8 to 12 inches across, then a square top will be fine. In warmer areas it can be thicker, but if you get a lot of snow where you live, especially the wet, heavy kind, then it will stick on that flat top and build up. The weight can bend and snap branches, ruining the profile of the hedge you so lovingly created. If you anticipate that problem, then rounding off the top, while still keeping it thin, will encourage snow to slide off before it gets too heavy and does damage. If you are making a neat hedge, it seems to make sense that you would have the sides exactly at ninety degrees to the ground. It makes sense, but it is not the best idea. A perfectly straight hedge will throw too much shade onto its lower parts, and they will not get enough light to keep them growing vigorously. If you slope the sides in a little, just a few degrees, which will only show if you stand exactly at the end and look along, then more light reaches the bottom. This means that those lower branches stay healthy and green for many, many years, giving you a green wall right to the ground. Take three pieces of wood, one 6 feet long, one 3 feet long and one 6 feet 8 ½ inches long. Join them together to make a triangle. You will see it has a right-angle in one corner, but if you attach the 6-foot piece at a point 6 to 7 inches inside the corner of the 3-foot piece, that 6-foot piece will make an angle of about 80 degrees to the vertical, not 90 degrees. If you hold the resulting triangle up to the hedge, with the small piece horizontal on the ground, that is the perfect slope for the front of your hedge. Just lean it against the hedge as you trim, and you will always keep the same slope, no matter how big your hedge is. Sounds a bit tricky, but it’s just a few minutes work. Once made, you can keep this guide forever, and always have the perfect hedge. For a shorter hedge, you can usually judge the slop by eye. Doing this will also solve problem number one – the top will automatically be narrower than the bottom. Keep the sides flat as well as sloping inwards. Letting it bulge in the middle, and trimming the bottom so it is rounded inwards, is a mistake that will only encourage the bottom to die out, leaving bare stems where you want lush green right to the ground. Especially if you have a sloping garden, don’t slope the hedge to follow it. Keep the top horizontal for that perfect look. Use a tightly-stretched string, and a line-level (a small gadget from the hardware that hooks onto a string) to get it perfect. The human eye is very, very good at judging horizontal, and a drunken hedge sloping up or down is very disconcerting! If you have a very sloping garden, and you are going to end up with a difference in height of more than a few feet, consider stepping the hedge down in two or three sections, with a nice vertical spot where the level drops. That is so much better than an irregular top, and just as easy to maintain, once established. If you follow these basic rules, your hedges will be the talk of the neighborhood. Remember to start trimming almost as soon as you finish planting. Don’t make the most basic mistake of all, and wait until you reach the final height before starting to trim. You will get the sturdiest, healthiest and densest hedge by trimming regularly, but lightly, while the hedge is growing up.